The discussion about the preservation and reuse of historic places has existed since the 1950s, thanks to the preservation laws that have been in place. The German Preservation Laws were passed in 1958, whereas the Historic Preservation Laws that established the National Park Service and National Register of Historic Places in the USA were enacted in 1966. Both serve the lone purpose of identifying and designating places unique to the cultural identity and history of their respective countries. Furthermore, these places are protected from any sort of modernization that would otherwise alter or destroy the structure in its original form. Protected places often receive tax credits, grants and other amenities that are normally and often not granted if it is not protected or even nominated for listing as a historic site. This applies to not only buildings and bridges but also to roadways and highways, windmills, towers of any sorts, forts and castles, citadels and educational institutions and even memorials commemorating important events. Dedicating and designating sites often receive mixed reactions, from overwhelming joy because they can better enjoy the sites and educate the younger generations, to disgruntlement because they want to relieve themselves of a potential liability. Since working with a preservation group in western Saxony on saving the Bockau Arch Bridge, a seven-span stone arch bridge that spans the Zwickau Mulde between Bockau and Zschorlau, six kilometers southwest of Aue, the theme involving this structure has been ownership. The bridge has been closed to all traffic since August 2017 while a replacement is being built on a new alignment. Once the new bridge opens, the 150-year old structure will come down unless someone is willing to step in and take over ownership and the responsibilities involved. . Taking the structure means paying for its maintenance and assuming all responsibility for anything that could potentially happen. And this is the key here: Ownership. Who wants to own a piece of history? To examine this, let’s look at a basic example of a commodity where two thirds of the world’s population wear on a regular basis- the author included as well: glasses. The author’s sunglasses: the older model from 2005 on top; the newest pair from 2018 at the bottom. Ever since Marco Polo’s invention, glasses have been improved, innovated and modernized to not only make the person look great in appearance. It also helps them to better see the environment surrounding them, regardless of whether they are near-sighted or far sighted, have astigmatism or require bi-focals to read, or if they want protect their eyes from the sun in the form of shades. Glasses can be plastic or metal (or even both). And like the historic structures, the materials can be recycled if no one wants them. Yet by the same token, many of us love to keep them for the purpose of memories or give them away to those who need them. For over 30 years, I have worn nine pairs of glasses and two pairs of sunglasses; this does not count the eight years that I primarily wore contact lenses, which was during my time in high school and college. Like our historic structures, glasses have a life span. They are worn until the frames develop rust and corrosion, the vision changes or they are broken. In some cases, many look for a new frames because they want to “look cool” in front of their peers. The “look cool” mentality has overtaken society to a point where it can be applicable to about everything: cars, clothing, houses and especially historic places and structures of interest. Basically, people just ignore the significance of these structures and things that had been built in the past, which hold memories, contribute to the development of a country, region or even community, or are simply fashionable. Still in spite of all this, one has to do something about the glasses, just as much one has to do something about the historic building. So let’s take these two pairs of sunglasses, for example. Like in the picture above, the top one I was prescribed by an optometrist in 2005; the bottom one most recently in June 2018. The top one is a combination of plastic and steel- the temples, ends and hinges are made of steel; the eye wires are plastic. The lenses are made with Carl Zeiss branded glass with a sealcoat covering to protect it from scratches. The bottom ones are plastic- frames, temples and nosepiece; the lenses are plastic but with a sealcoat protectant and dimmers to protect the eyes from the sun. The brand name is generic- no name. The difference is that the changes in the eyes required new sunglasses for the purpose of driving or doing work outside. As I wear the new sunglasses, which are not as high quality but is “cool,” according to standards, the question is what to do with the old sunglasses? There are enough options to go around, even if the sunglasses are not considered significant. One can keep the old pair for memory purposes. Good if you have enough space for them. One can give them away to someone who needs them. If they are non-prescription lenses, that is much easier than those with a prescription. With the prescription lenses, one will need to remove them from the frame before giving them away. Then there is the option of handing them into the glasses provider, who takes the pair apart and allows for the materials to be recycled. More likely one will return the old pair to the provider to be recycled and reused than it would be to give them away because of the factors of age, quality of the materials and glass parts and especially the questions with the lenses themselves. One can keep the pair, but it would be the same as leaving them out of sight and out of mind. And this mentality can be implemented to any historic structure. People strive for cooler, more modern buildings, infrastructure or the like, but do not pay attention to the significance of the structure they are replacing in terms of learning about the past and figuring its reuse in the future. While some of these “oldtimers “ are eventually vacated and abandoned, most of them are eventually torn down with the materials being reused for other purposes; parts of sentimental values, such as finials, statues and plaques, are donated to museums and other associations to be put on display. The Bridge at Pointer’s Ridge. 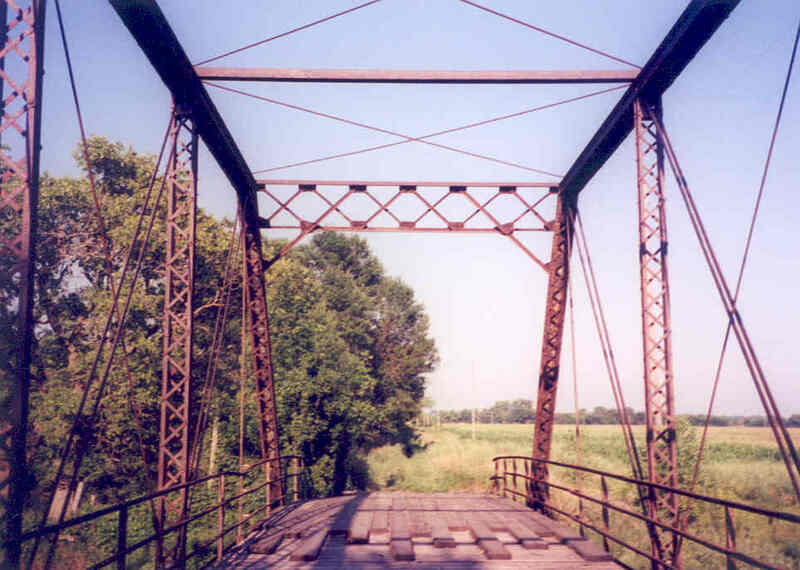 Built in 1910 by the Western Bridge Company of Omaha, NE. 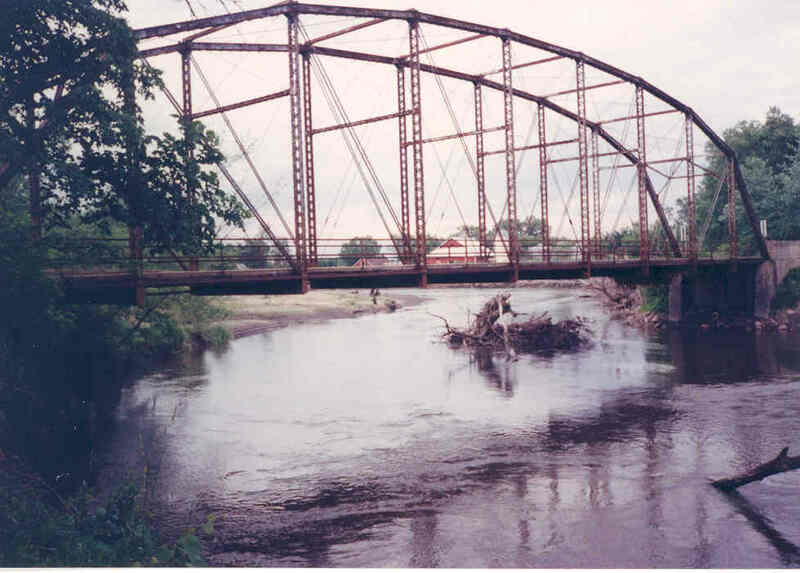 The Big Sioux River crossing was one of five bridges removed after years of abandonment in 2012. Photo taken in 1999 when it was still open. This leads me to my last point on the glasses principle: what if the structures are protected by law, listed as a historic monument? Let’s look at the glasses principle again to answer that question. Imagine you have a couple sets of glasses you don’t want to part ways with, even as you clean your room or flat. What do you do with them? In the case of my old sunglasses, the answer is simple- I keep them for one can reuse them for other purposes. Even if I allow my own daughter to use them for decorating dolls or giant teddy bears, or even for artwork, the old pair is mine, if and only if I want to keep them and allow for use by someone else under my care. The only way I would not keep the old sunglasses is if I really want to get rid of them and no one wants them. Big Sioux River Crossing at 255th Street: One of five bridges removed in 2012 after decades of abandonment. Photo taken in 1999. For historic places, this is where we have somewhat of a grey area. If you treat the historic place as if it is protected and provide great care for it, then there is a guarantee that it will remain in its original, pristine condition. The problem is if you want to get rid of it and your place is protected by law. Here you must find the right person who will take as good care of it as you do with your glasses. And that is not easy because the owner must have the financial security and the willpower just to do that. Then the person taking it over does not automatically do what he/she pleases. If protected under preservation laws you must treat it as if it is yours but it is actually not, just like renting a house. Half the places that have been torn down despite its designation as a historical site was because of the lack of ownership and their willingness to do something to their liking. Even if there are options for restoration available, if no one wants it, it has to go, even if it means taking it off the historic registry list to do that. Sometimes properties are reclaimed at the very last second, just like the old glasses, because of the need to save it. While one can easily do that with glasses, it is difficult to do that with historic places, for replacement contracts often include removal clauses for the old structure, something that is very difficult to rescind without taking the matter to court. In reference to the project on the Bockau Arch Bridge in Germany, we are actually at that point. Despite its protection as a historic structure, its designation was taken off recently, thus allowing for the contract for the new bridge at the expense of the old structure to proceed. Yet, like with the pair of old glasses, last ditch attempts are being made to stop the process for there are possible suitors willing to take over the old structure and repurpose it for bike and pedestrian use. While neither of the communities have expressed interest, despite convincing arguments that the bridge can be maintained at a price that is 100 times less than the calculated amount, the group working to save the bridge is forming an association which will feature a network of patrons in the region, willing to chip in to own the bridge privately. Despite this, the debate on ownership and the bridge’s future lies in the hands of the state parliament because the bridge carries a federal highway, which is maintained on the state and national levels. Will it become like the old pair of glasses that is saved the last second will be decided upon later this fall. To summarize briefly on the glasses principle, glasses and buildings each have a short lifespan because of their functionality and appearance. We tend to favor the latter more than the former and therefore, replace them with newer, more modern and stylish things to keep up with the pace. However, the older structures, just like the discarded pair of glasses, are downgraded on the scale, despite its protection under laws and ownership. When listed as a historical site, the proprietor works for and together with the government to ensure its upkeep, just like lending old glasses to someone for use, as long as the person knows he/she is “borrowing” it. When it is not listed , they are either abandoned or torn down, just like storing the glasses in the drawers or even having them recycled. However the decision is final if and only if no one wants it, and this could be a last-second thing. 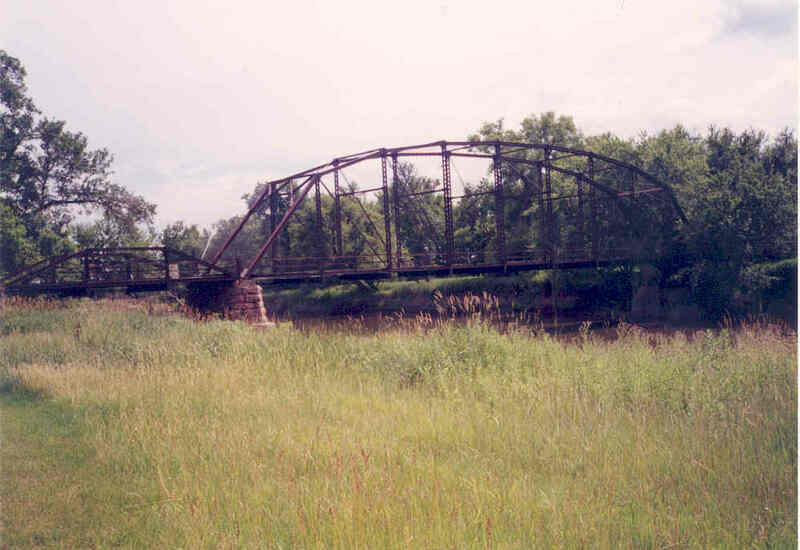 The Bridge at Iverson Crossing south of Sioux Falls. Built in 1897, added to the National Register in 1996. Now privately owned. Photo taken in 1998. We cannot plan ahead for things that need to be built, expanded or even replaced, for there may be someone with a strong backbone and staunch support who will step in the last minute to stake their claim. This applies to replacing older, historic structures with modern ones that have less taste and value. In the face of environmental issues we’re seeing globally on a daily basis, we have to use and reuse buildings and other structures to prevent the waste of materials that are becoming rarer to use, the destruction of natural habitats that may never recover but most importantly, remind the younger generations of our history and how we got this far. While some of us have little memories of our old glasses in schools with the exception of school class and party photos, almost all of us have memories of our experiences at, in, or on a historic structure that deserves to be recognized and kept for others to see. It’s just a matter of handling them, like the glasses we are wearing.